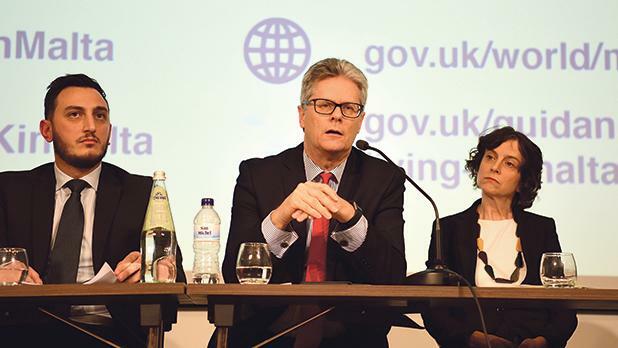 Midway through a public meeting organised by the British High Commission to inform British citizens in Malta of their rights post-Brexit, a Maltese government official assured those present that applying for their new residency status would be a “smooth and seamless transition”. He was met with an eruption of laughter. It was a moment that summed up the mood among the hundreds of British residents packed into a conference room in Qawra on Wednesday, who, despite the assurances of Maltese and UK government representatives, voiced doubts and uncertainty on issues ranging from their residency rights and work permits, to healthcare and driving licences. Opening the meeting, the first of a series to be held over the coming weeks, British High Commissioner Stuart Gill said that under the terms of the UK Withdrawal Agreement, “British nationals in Malta will have a legal guarantee that they will be able to stay here with broadly the same access to healthcare, pensions and other benefits as they have now”. But as the March 29 Brexit date approaches, it remains unclear whether the withdrawal agreement will be approved or whether Britain will crash out of the EU with no deal. On this scenario, Mr Gill stressed that a number of member states, including Malta, had made a political commitment to maintaining all current rights for British citizens. For many of those in the room, however, this did not seem to be enough. “Listening to all the questions here, we still have no idea what’s going to happen,” one person said. Although the Maltese government representative, Glenn Micallef from the Ministry for European Affairs, repeatedly stressed the strong relationship between the two countries and the commitment to protecting citizens’ rights in any eventuality, most of his answers fell into a similar pattern. “If there is a deal in place, there will be specific provisions that cover this,” he said in response to one question on converting professional qualifications. The woman who posed the query, a UK barrister who has worked in Malta under EU regulations for years, did not seem impressed with the reply. “So, if there’s no deal I can close down now and dismiss my Maltese employees,” she said. Responding to one man who said he did not yet feel reassured about his right to work in Malta in the event of a no-deal, the Maltese government representative conceded that a political discussion would have to take place, but pointed to the economy’s openness to a foreign workforce. As the meeting wound down, some took the opportunity to put their sentiments across more wryly. “Most of us don’t have €650,000 to buy a Maltese passport,” one man noted.